You got the gown for the bride, now it's time to dress the rest of the bridal party. The mothers, the sisters, the bridesmaids all need wedding wear apropo for walking down to the chuppah and for looking their best for pictures. 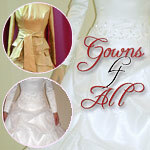 Click here for Bridal Gowns . Gowns 4 All offers a large up-to-date magnificent selection of gown rentals for brides, mothers, and sisters as well as exquisite headpieces and veils right here in Baltimore! Alterations and cleaning are all taken care of for you and included in the rental price! Shifra Green specializes in designing and creating original custom wedding gowns, custom dresses for all occasions as well as alterations. Starting with the initial sketches to selecting the right fabric, and all the way through to the final fitting, we collaborate to envision, design, and create the gown of your dreams!